Our popular tour and tasting days run between May and September each year. This voucher entitles you to a tour and tasting session at Albury Vineyard, perfect for wine lovers! Enjoy a tour of the vineyard with our owner of vineyard manager and gain an insight into our passion for organic produce, biodynamic viticulture and quality English wine. 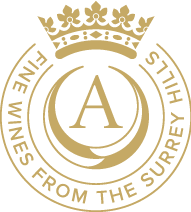 Learn from us about the rise of the English wine scene, and taste our latest releases. £5 of the ticket price is redeemable against sparkling wine purchased (bottles only) on the day. Vouchers are valid for 12 months from date of purchase but please note that tours run between May and September only. Vouchers will be sent via email (within 1 working day) or posted on request (within 3 working days) - select the option you prefer from the dropdown below.